Greetings from the Association of the United States Army (AUSA), our Army’s association for education and professional development and a major supporter of the Army’s Soldier for Life efforts. 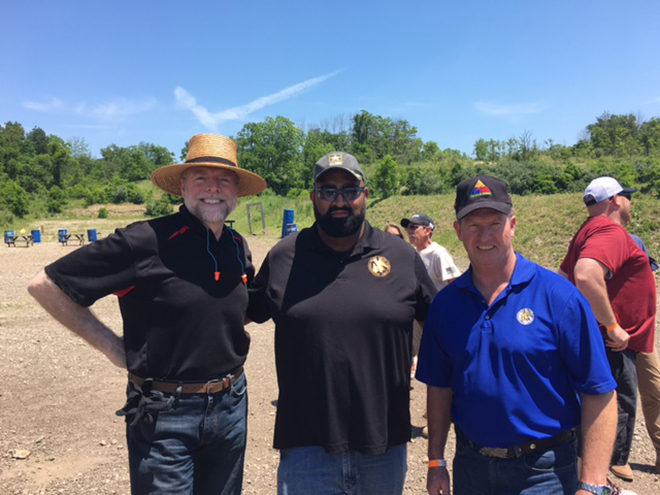 I had the opportunity to attend the 5th Annual Fort Pitt Warrior Shoot held on June 3. Dr. Andrew Masich, president and CEO of the Heinz History Center; Carlos Carmona, Fort Pitt Chapter president, and retired Sgt. Maj of the Army Ken Preston attend the Warrior Shoot. Special thanks to the Fort Pitt Chapter, the Heinz History Center, Special Tactics and Rescue Training, and FN firearms for hosting this event. Gordon Lam, Fort Pitt Chapter vice president, sent us a report, below, on the day’s activities. The Fort Pitt Chapter’s annual Warrior Shoot event, co-hosted with the Heinz History Center, Special Tactics and Rescue Training, and FN was held to celebrate the U.S. Army’s 242d birthday with a day of camaraderie, team building and esprit de corps. Over 125 chapter members, veterans, family members and friends of the armed forces attended the event. Beginning in 2013, the Warrior Shoot’s popularity has grown substantially and the chapter had to limit the number of participants because the range facility reached its maximum safe capacity. Twelve newly inducted Pennsylvania Army National Guard soldiers participated in this year’s event and they had the opportunity to hear from retired Sgt. Maj. of the Army Kenneth O. Preston, Association of the U.S. Army vice president for noncommissioned officer and soldier programs. Preston discussed the soldiers’ enlistment decision and the opportunities that lay ahead for them during in their time in the Army. Highlighting the day’s event was the opportunity to fire an array of pistols, rifles and machine guns courtesy of FN firearms. Several participants were afforded the opportunity and unique experience to fire the Civil War mountain howitzer provided by Dr. Andrew Masich, president and CEO of Heinz History Center. Other notable participants included Dr. Rory Cooper, civilian aide to the secretary of the Army; Eric Templin, ATI executive; Havard Klokkerud, general manager, Kongsberg Protech; and Joe Dornbrock, executive director, Keystone Chapter, Paralyzed Veterans of America. The venue for this annual event, now in its fifth year, is the Special Tactics and Rescue Training (START) facility in Mingo Junction, Ohio. This program provides the Fort Pitt Chapter with the opportunity to bring its general membership together to celebrate the U.S. Army’s birthday, promote support for the Regular Army, National Guard and Army Reserve in the Greater Pittsburgh area, along with their family members and guests. This day also underscores the importance of the spirit of support for the warrior community of Western Pennsylvania. Chapter corporate members attending included ATI, BNY Mellon, and Heinz History Center. The guests were also treated to a BBQ lunch and all participated in the traditional cutting of the Army birthday cake by the oldest and youngest Army veteran present. Joining chapter president Carlos Carmona Torres and Preston was for this ceremony were a 74-year old veteran and 17-year old new Pennsylvania Army National Guard recruit. This year’s event resulted in 35 new AUSA memberships. There is no substitute for the knowledge and wisdom gained through experience and when you are a young up-and-coming Army professional, associating with other members of your profession with varied experiences creates a unique opportunity to learn through the eyes of others. AUSA chapter events – like the Fort Pitt Chapter program – that provide opportunities for new soldiers to interact with each other and talk and learn from veterans are very important for all of us.